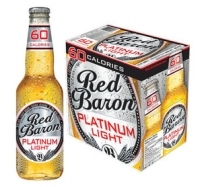 WATERLOO, ON – Brick Brewery is set to extend its Red Baron brand once again with the introduction of Red Baron Platinum Light, which is being billed as the lowest calorie beer in Canada, with 60 calories per bottle. Red Baron Platinum Light is specially brewed for Canadian beer tastes by blending premium two-row malted barley and a touch of wheat resulting in a fresh, crisp light beer with rich colour and the clean flavour you expect from a light beer. Red Baron Platinum Light will be available at Beer Store locations in Ontario starting November 1st, and will retail for $9.95 per six-pack, including bottle deposit.